Reason I choose it: I loved the sound of the title so decided to see what it was all about. Special Agent Dagny Gray is smart, athletic, and fearless. She’s also fragile, depressed, and anorexic. 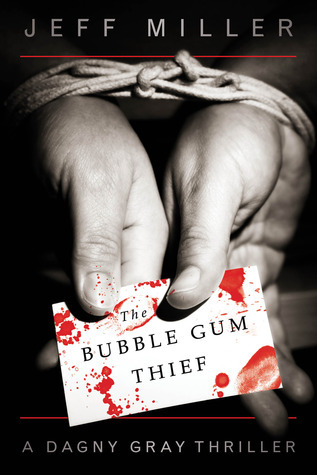 If she doesn’t get healthy soon, the FBI will drop her—and she’ll never have a chance to end the crime spree of the so-called “bubble gum thief.” It all started with the theft of a pack of gum, and the ominous note he left behind: THIS IS MY FIRST CRIME. MY NEXT WILL BE BIGGER. Every two weeks, he delivers on this pledge, committing a bigger crime, and promising that the next will be even worse. When petty theft gives way to bloody murder, the stakes become clear. He may have begun with the smallest crime possible, but he’s building toward the biggest crime imaginable. There’s a method to the gum thief’s madness, and Special Agent Dagny Gray knows she can figure it out…if the Bureau will let her. But will it be in time to prevent the cataclysmic finale of his escalating spree? This as you'll have guessed is a crime book where the first part of the chapters switch mostly between Dagny and the Thief. You learn a lot about Dagny but not all that much about the thief, I would have loved to have gone in to his mind a bit to see why or what he was plotting more then we did. The 2nd and 3rd part is of Dagny and her friends solving the mystery which I enjoyed but again I would have loved more about the Thief. It had a slightly predictable twist at the end which filled in a few more gaps and made you realise how a few people can change someones life so drastically. Its not like your usual crime book though where you have to try and guess who the thief is as like I've mentioned so much already you never really learn all that much about the actual thief. I enjoyed it which is the main thing.